On my mind tonight is my dear friend Ed McClanahan, much-beloved Kentucky author of such well-regarded books as The Natural Man and O The Clear Moment, also recognizable as one of the Merry Pranksters, a cluster of boisterously titillating 1960s counter-culture heroes famous for their cross-country, purply-hazed travails in a bus called Furthur. Other members included a handful of future Pulitzer Prize winners. Novelists in dreamtime. The 1960s. LSD and electric Kool-aid. Ed and his bunch were the center of what mainstream America considered to be an irrational and irresponsible movement designed to upset the U.S. status-quo mommy-daddy post-war American apple cart. Which is exactly what it was. I might have only been eight years old when that bus made its well-intended trip, but as a rural kid in southern Indiana, I rode a school bus, I knew the drill, so right away kinship was established. I watched hippies dancing in the Pacific ocean on the nightly news and pored over pictures of their San Francisco bohemian invasion in Life magazine. It was pretty clear in my country girl mind that these people had more going for them than the neighbors up the road with their vagrant cows that regularly head-butted loose our fence or the people at Mt. Zion Methodist with their Jesus fans and dollars for the offering plate or my impoverished grandparents who scraped out their existences in the hollers of Adair County, Kentucky. I belonged in love beads and hippie headbands and fringed jackets and and those big, round Janis Joplin sunglasses. I was pretty sure I mattered in the same way those psychedelic bus riders mattered. We now know that the traditional explanation of the origins of the Thanksgiving holiday is a great big over-exaggeration aimed at the imaginations of school-children. Imp-lured European malcontents came by the shipload to this continent and killed its inhabitants. Plenty of malcontents died, too. The Pilgrims nearly starved to death and maybe or maybe not did the east coast aboriginals share a spot of food with them. Puritans had a habit of alternating days of thanksgiving with days of fasting. Days of fasting had to do with appeasing their bearded god after bad things happened. So, no, at no time were there big, white linen-clothed tables full of horns-of-plenty and buckets of cranberries and great-breasted turkeys (really—have you ever seen a wild turkey? a naked wild turkey does not look like a supermarket turkey, nor does one look like what we see depicted in those melodramatic “first Thanksgiving” paintings) shared by black-coated Europeans (did you ever think about just how hard it would have been to keep those starched bib collars white?) and bead-draped natives. Just bloodshed. It was all just bloodshed. Why is Thanksgiving Day not a day of mourning? No wonder they call the day after Black Friday. If we are thankful and gluttonous on Thursday, greedy and gluttonous for material goods on Friday, where is the balance? Who is helped? Who is saved? We owe it to the Imp of Thanksgiving, that little varmint who has taken up residence in our American brains, made us think genocide is cause to celebrate, is sacred when it should be cause celebre, as genocide remains our national pastime today. If you think about it, we are a culture without a true country. This place is not ours. Our imps led us here. It is where we will eventually de-materialize and return to dust as we project our self-destruction on the very earth beneath our feet. We deserve no less, really. So what I’m going to share here is not what I plan to cook on Thanksgiving Day, but some new recipes I want to try on Thursday, which is the day after I return from my most recent Clearwater Writers retreat where this past week I’ve been mentoring a writer through the final paces of a first novel draft. Since Phil does most of the cooking now that he’s retired, and as Thursday is a big football day, I’d like to give him the day off to watch beefy men chase their imps in the form of a pigskin ball (sorry, vegan readers, for the word choice, but I couldn’t help myself). It’s been a long time since I cooked exclusively from someone else’s recipes, but I feel inclined to try these, and to see what it takes to make them my own. It started when my daughter-in-law Katie forwarded me this one for Vegducken, and I realized what I was missing by not exploring the vast land of Internet recipe bloggers. vegducken—I’ll make this into veganducken by switching out the mushrooms (I’m allergic) for ground tempeh, chia seed for the eggs, use my own blend of olive oil, toasted sesame oil, and coconut oil to replace the butter, and a mix of tahini, nutritional yeast, and miso for the Parmesan. If it turns out, I’ll share the recipes with my subscribers, so that’s one more good reason to click the Subscribe button! lentil bread—November marks the beginning of baking season for me. As soon as the thermometer drops, rather than upping the thermostat, I like to find reasons to use the oven. I’ve been experimenting with fermented breads this year, and I love them. This savory lentil bread will up the meal’s protein ante. cranberry spread—Why cranberries got relegated to November and December, I have no idea, unless it’s because their massive dose of Vitamin C helps us get through cold and flu season, but I do have a hunch that the tangy flavors in this hot-pepper-spiked cranberry spread will go great with the cumin in the lentil bread. raw lemon-lime cheesecake—And because I haven’t had cheesecake in almost 6 years, I hope this is as good as it looks. If it is, I expect I’ll start morphing it and passing it onto my subscribers (yes, that was hint #2). Whatever you do Thursday, do it with the best of intentions and with an eye toward what matters most in the world right now. Put your imp in his crate and keep him there. Make your day about preparing yourself for the harder roads ahead—roads that are going to require us to make tough choices. Light a candle for all who’ve been sacrificed to let us live as we live, and cherish the privileges and comfort that have been bought with so much blood. Let Black Friday just be another Friday. 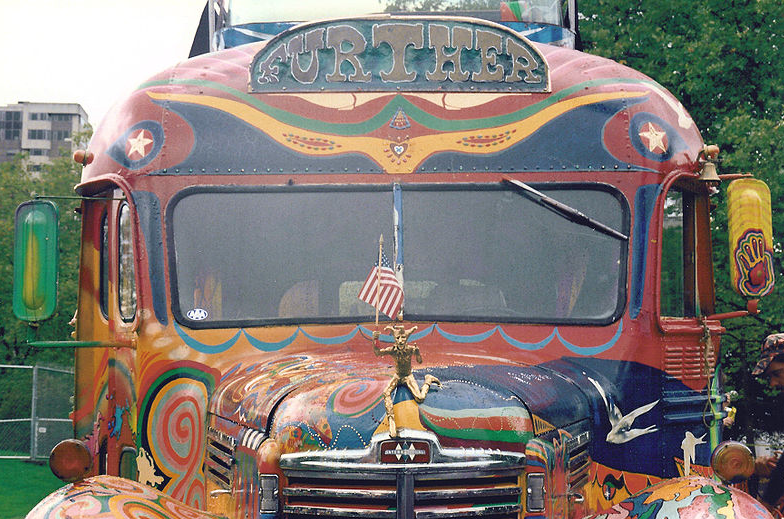 Think about spending it creating your own metaphoric version of a psychedelic bus. What would that be for you? What, using the most vivid corners of your imagination, is the counter-culture of your current life?